Yesterday, as I drove to work, I drove through thick clouds of fog. I remember driving past this house that was so shrouded you could only see the silhouette of it & the surrounding trees. It was eerie & yet it was beautiful at the same time. It reminded me of the way we view our world- that life, humanity, & our surroundings are so beautiful & inspiring & yet they are still lacking in comparison to what Heaven will be like. Where what we see now is beautiful & inspiring…but it’s still a little foggy, blurred, & darkened by the effects of sin & separation from God…not how He intended it to be. Can you imagine that? Think of the absolute, most beautiful thing you’ve ever seen or witnessed- maybe the birth of a child, a stunning landscape, soul-soothing musical composition, a beautiful painting, or the inspiration of someone’s story. Think of it in its stark beauty then imagine those things with all their imperfections removed- no pain, no death, colors & sounds brighter & more beautiful than our minds could imagine or our bodies could handle! It really is unimaginable, & yet that is the hope we have in Christ. That if we give up our own ways & choose to follow Him, that veil of fog around us will be lifted- His world no longer dampened, darkened, & blurried by the burdens of sin. He will lift that veil of fog & we will be face-to-face with the Creator of the universe, our eyes opened, our questions satisfied, & our world filled with God’s unimaginable glory, love, & peace. I can’t wait for the day- to see, hear, do, & know things that are impossible & unknowable here & to have it for all eternity. And yet, it is your choice, whether to have that veil lifted one day, or not. Some people would argue “how can God be so ‘loving’ & yet punish people to Hell?” The problem is that God does not condemn us, our sin does. Our nature to follow our own way instead of God’s automatically separates us from Him & condemns us. He could’ve chosen to let us go straight to Hell, & yet, (to borrow a phrase from CS Lewis & the Chronicles of Narnia), He chose to become “the Great Bridge-Builder,” for our sakes. You see, the world was already condemned, not by God but by our sin. You can’t SAVE something that is not already in danger of being lost. 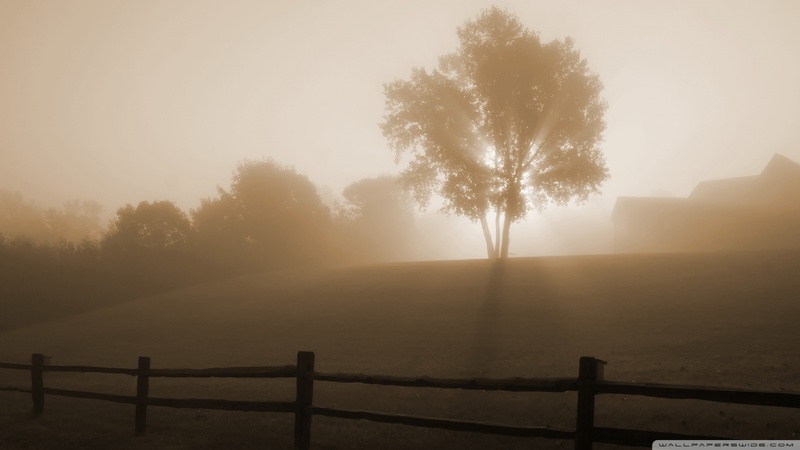 The choice is yours- continue living in a world veiled in fog or choose a Savior who will lift that fog. As beautiful & inspiring as the world around us is, you cannot deny (unless you live under a rock) the world is scarred by pain & suffering. Those are the scars left by the effects of sin & our misguided, selfish choices. And yet God still reaches our His hand for you, to grab you, heal the wounds, rescue you…but it’s up to you to let go of the rock of sin sinking & drowning you, & grab it His saving hand.